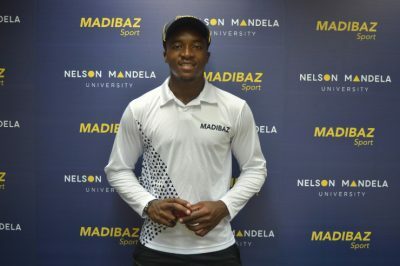 Madibaz cricketer Lutho Sipamla was "surprised and shocked" to get a call-up to the Proteas cricket team, but is determined to make the most of the opportunity. The 20-year-old fast bowler, who is in the second year of a business management degree, was named on Friday in the national squad for the three-match Twenty20 series against Pakistan. His selection comes after he caught the eye of the cricketing world with some impressive performances in the Mzansi Super League last year, finishing the inaugural competition as the second highest wicket-taker (16). After he received the call informing him about his selection, Sipamla said he was "happy, nervous and emotional all at the same time". "It was not something I was expecting and although I know I have put in a lot of hard work it still came as something completely out of the blue. "Of course it is very exciting for me because it has been a dream [to play for South Africa] since I was a young boy," added the former Grey High pupil. "Hopefully I will get a chance to play and I just want to go out there and make the most of my opportunity. "I'm definitely excited about my cricket at this stage and am looking forward to the challenge." Last year Sipamla, along with Madibaz colleague Tiaan Koekemoer, was selected for the University Sport South Africa side and at the start of the 2018-19 season he was chosen for the Warriors franchise squad. "When you play franchise cricket you have to be good and on point, and I had to work a lot on my execution and my consistency," he said. "Concentrating on that helped me to improve my overall game and become a better player, I guess." He added that the coaching teams at Madibaz and the Warriors had been "a big driving force in my cricket". "Every practice and every game I play I get to learn from all the seniors by speaking to them and asking questions. "Every day I am learning and that's what I need to do at this stage. "I am looking forward . 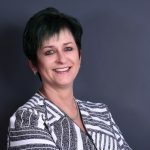 . .
Johannesburg 29 January 2019 - Enterprise Development (ED) and Supplier Development (E&SD) is one of the most current government and private sector driven programs, after the 2003 Broad Based Black Economic Empowerment (BBBEE) document. These programs are racially selective systems to empower previously disadvantaged groups and to enhance the economy, in South Africa. According to the Stellenbosch Business School, Enterprise Development is defined as ‘the act of investing time and capital in helping people establish, expand or improve businesses.’ This certainly presents young entrepreneurs, inventors and those with unique business ideas, with the opportunity of making a difference in society - not just for themselves, but for other economically active citizens as well. At the end of 2018, nearly 800 000 matric candidates sat for their final exams across the country. Of these many will opt to further their studies through a tertiary institution, but for those who will be seeking employment, it will not be easy. According to an article in Fin24, less than a quarter of matriculates will find jobs relatively quickly. The economist, Mike Schüssler of economists.co.za said in the online article - about the previous year’s matriculates - dated January 2018, “Those members of the matric class of 2017 who will not be studying further, but will be looking for a job, will not be easily absorbed by the job market.” He continued, “it will be tough for them to get work. Over 50% of our matriculates under the age of 34 have not found permanent employment and it’s not getting better.” [https://goo.al/pfEP3H] Whilst the facts of the situation are important, seemingly, discomforting news articles make those who just completed their exams, be it in school or a tertiary institution, rather despondent. These are meant to be the years to which they look forward to making a difference and impacting the South African economy; and those communities in which they live. Those . 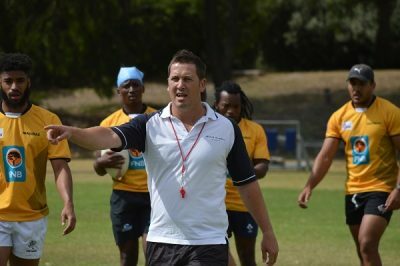 . .
New Madibaz rugby coach Jarryd Buys is banking on a strong work ethic as the Nelson Mandela University outfit face a challenging season in the Varsity Shield competition, starting next month. After being relegated from the Varsity Cup last year, Madibaz will spend two seasons playing Varsity Shield rugby as the promotion-relegation matches take place only every second year. Buys, a former provincial player who coached the team at last year's University Sport South Africa week, did not sugar-coat their situation as he reflected on 2018. However, he remains positive about the path which lies ahead. "The relegation to the Shield was a big shock for a team that competed in semifinals not that long ago and we are certainly not taking the change lightly," he said. "Unfortunately we have lost a lot of players, especially seniors, either through age, graduation or moving on to other opportunities. "But we do have a great group of young players that we will look to build on." He added that the critical element in their approach would be to ensure they maintained the high standards set at Madibaz rugby. "We are a team who will compete in the Shield, but we will train and play as if we are competing in the playoffs of the Varsity Cup. "Culture-wise we want to have a team which is very sound academically and able to compete with the rest of the universities in the country." Buys said they had placed a massive emphasis on adopting the right frame of mind by not agonising over their situation. "Eastern Cape sport sometimes carries the baggage of being underdogs and it is something that needs to change," he said. "It is easy to talk about finances and what other teams are doing, but our main focus is having the right mentality to win rugby games on a regular basis. "As long as we, as the management team, can take care of the off-field work, the guys will produce the goods on the field. This Madibaz rugby team wants to win!" The coach added . . .
Gillitts, South Africa – School-Days, a bursary-building platform for South African families, recently gave four young South Africans R25,000 bursaries to use towards education fees. The bursary competition was run in conjunction with the launch of the Dis-Chem FOR YOUTH card, a new Dis-Chem rewards programme tailored to 18-25 year-olds. Through School-Days, anyone has the power to build their own bursary to pay towards their family’s fees. Over 300,000 people are already putting the future of education in their hands by building School-Days bursaries. To celebrate the launch of the Dis-Chem FOR YOUTH card with fanfare, School-Days gave four lucky winners a massive bursary head start. 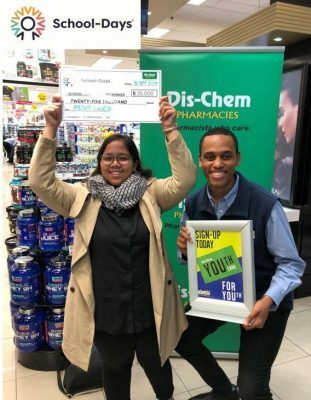 The first to win a R25,000 School-Days bursary was 21-year-old Ayesha Cloete. Ayesha is going to use the bursary to pay for her final year of studies towards becoming a foundation phase teacher at the University of the Western Cape in Bellville. She said: “This bursary will help me cover a large chunk of my university fees for the academic year, which is a relief for me.” Ayesha continued: “I think that education will always be the single pathway to a better future, no matter what your circumstances are. I would like to thank School-Days for this bursary and for helping me, as an aspiring teacher, to educate tons of bright minds in the near future!” Jade Dilley was the second R25,000 bursary recipient. She is studying towards an LLB degree at NMMU in Port Elizabeth. Jade has been using a student loan to fund her studies, and she says it is a real struggle for her family to find the money for university fees each year. The R25,000 bursary will pay towards her studies this year. She said: “I don’t think you understand how much you have changed my life. I only go to varsity when I am able to due to finances, and whenever I leave, I think ‘I may not even be able to be here next year’. If it weren’t for School-Days, I’d still be feeling like that today. Thank you so much! I . . .
[Johannesburg, Gauteng, 28/01/2019] - PrepaidWealth.com, a recently launched South African FinTech Startup for accumulating cash or providing discounts when data and airtime is purchased from the platform, is launching a programme that will enable schools to raise money passively from teachers and parents when they buy their personal data and airtime. Schools will create their own group accounts separately on the PrepaidWealth.com platform. Teachers and parents will then join the group on their own or ask the school to include them. Every time the parents and teachers buy data and airtime from the platform, 80% of the margins or discounts that retailers get from data and airtime will be donated to the schools for fundraising purposes. The platform accumulates 80% of the discounts collectively from all the teachers and parents within a school group. The accumulated discounts can be withdrawn in cash once the accumulated amount is at least R200. The discounts provided to retailers vary from 1.5% to 9.5% and therefore one can assume an average discount rate of 5%. A school that can get 350 teachers and parents to join the school group on PrepaidWealth.com as members can raise R25,500 per year, assuming that they spend an average of R150 on data and airtime per month each. The data and airtime provided on PrepaidWealth.com is from all mobile service providers; namely, Vodacom, MTN, CellC, Telkom, Virgin Mobile. The platform also provides prepaid electricity services as well as services from Mozambique Vodacom and Econet Mobile. “The schools programme will unlock a passive way of raising funds for curriculum and extra curriculum activities for schools. 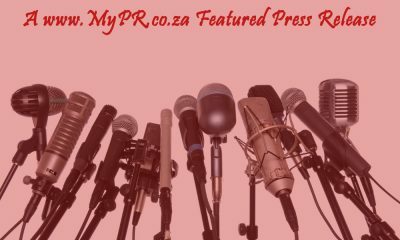 At some schools, it might replace or complement the currently used fundraising methods” – Gabriel Nkuna, co-founder of PrepaidWealth.com CLICK HERE to submit your press release to MyPR.co.za. More Info on FinTech Startup launches a programme that will raise money passively from data and airtime for . . . Port Elizabeth matriculant and Engen Maths and Science School alumni, Kamvalethu Hlatshwayo did not allow the passing of his father in 2012 or subsequent financial constraints get in the way of studying towards his dream job. Kamvalethu, who is starting the four-year journey to achieve a Bachelor of Engineering (Chemical) at Stellenbosch University this year, says he will tackle the challenges ahead the same way he achieved his incredible success at school. Kamvalethu beat out 46 fellow matriculants at the end of last year to take top spot in the Engen Maths and Science School (EMSS) class based at the Nelson Mandela University in Port Elizabeth. 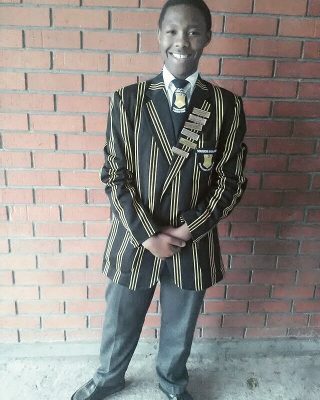 Achieving 80% for science and 79% for maths, he credits the extra lessons provided by EMSS for his outstanding results, which were enough to ensure he finished second amongst all the leaners who wrote the 2018-matric examinations at the three EMSS schools based in the Eastern Cape. “It’s all about hard work, managing your time and your priorities,” says the 18-year-old, whose greatest challenge was not believing in himself at first. Kamvalethu grew up in KwaNobuhle, a township on the outskirts of Uitenhage, and attended Solomon Mahlangu High School. He is however adamant that he could never have achieved such academic excellence without the commitment of the Engen programme teachers, who gave him the support he so desperately needed over three years from Grade 10 to Grade 12. “The EMSS programme helped me not only academically but also with life lessons and made me want to learn more and to attend classes all the time.” He was also inspired by his science teacher, Mr Stuurman who, he says, was his mentor even though he might not have been aware of the impact of his advice. “I took it and live by it.” Kamvalethu has the following advice for the 2019 matriculants. “This is your last year in high school so make it count, the decision you make this year will impact your life in the future, life begins . . .
Great businesses are not merely built on service but exceptional service and great customer experience; and an important element of their success is the value-proposition they deliver to their customers. Great businesses understand that for them to thrive and survive, they need to be constantly focusing on delivering value to their customers. “Exceptional businesses differentiate their offering on service and not necessarily price alone because research has proven again and again that consumers are willing to pay a premium, provided they “get great service” and great value for what they are paying for”, says Femi Adebanji, Customer Service Speaker and Expert. Femi, who heads the Service Excellence Institute, South Africa, further goes on to add that if organisations want to deliver the type of value that sets them apart, then they first need to be clear on two things: Firstly, what their “value-proposition” to their customers is and secondly, be clear on how their customers define value. “Otherwise, you might think you’re offering your customers value and be completely off the mark”, says Femi. He goes on to add that in the customer-economy where we find ourselves, the truth is that the power has shifted from businesses to consumers and thanks to the power of social media, consumers now have the power to shift and shape perception for or against brands. Consequently, businesses must focus a lot more on asking themselves – how do we deliver, tangible, exceptional value to our customers while delivering a seamless and hassle-free customer experience? If your value-proposition is not compelling enough, the fact is that potential customers will end up buying from your competitors and not from you. 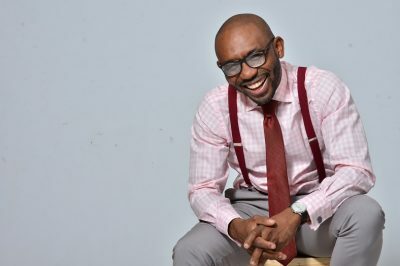 ‘A simple way of coming up with a compelling value proposition, says Femi, is to ask yourself the two important questions your customers are asking themselves, which is “Why should they buy from you and not your competitors and secondly, what’s in it for . . .
[Cape Town, 19 January 2019] – Since its official launch in Q4 of 2018, NJIN Agency has prioritised the signing of specific (much-loved) South African brands and companies where the agency felt it could make a real and positive impact. By signing with the WSB Cape Cobras Cricket Team as its full-service digital marketing and technologies partner, NJIN Agency is taking strides to further position itself as the go-to agency for South African sport, music and entertainment companies. >> view NJIN Agency website “To be fair, we’ve previously enjoyed an association with the WSB Cape Cobras under the umbrella of our former parent company, so it’s not like this is 100% new,” says Head of Agency, Brandon Faber. “But we’re happy that we’ve been chosen to take over and move that relationship forward . . . Following our recent partnership with The Parlotones, we’re satisfied with the way iconic and Proudly SA brands are embracing our message.” Driven Specialists. #NO.BS Community-focused with an unwavering commitment to getting the very best performances out of their team, The WSB Cape Cobras is very much a mirror image of NJIN Agency’s approach to service delivery. “The WSB Cape Cobras are proudly pedantic about who we choose to partner with,” says Brand and Sponsorships manager, David Brooke. “NJIN Agency has proven itself to be reliable and thoughtful in their approach to our digital marketing and technology requirements . . . we expect great things from our partnership going forward.” Driven Specialists. #NO.BS “We’re just super-chuffed to be able to contribute to the WSB Cape Cobras,” says NJIN Agency MD, Dennis Armstrong. “For our Cape Town-based clients and team-members the association also affords the opportunity to watch some of the world’s best players showcase their talent in what is, surely, the most beautiful cricket ground on the planet. We’re honoured to be a part of the WSB Cape Cobras family.” For more information please visit . . . REMOVE ME: Mahala Johannesburg 19 January 2019 - You definitely don't want to miss out on the best way to kick off 2019! If you’re a cool cat, you will know about Woodstock! In the summer of 1969 Woodstock made history through its three day music festival, which was held on a dairy farm in the Catskill Mountains, northwest of New York City. The festival attracted more than 400, 000 people, who gathered in the name of peace and music. It was unexpected and at the same time, gave rise to the notion that human beings are inherently good and peace loving; and music is the food that feeds such souls - plus, we all need a day or three out of the city. 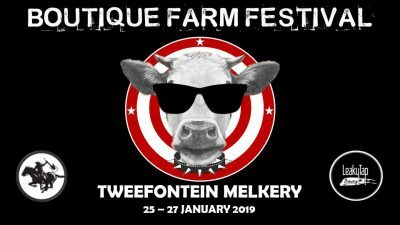 Boutique Farm Festival 2019 (#BFF2019) offers you just that - a three day festival with more than 20 of South Africa's greatest music acts, hosted at the Tweefontein Melkery farm, conveniently located just off the R21 between Pretoria and Kempton Park. Unlike Woodstock, we want to manage expectations and are starting out small. We have made 400 tickets available to the public, which includes free camping for three (3) days and to ensure your comfort, we promise you enough showers and toilets. Bring your friends, your tents and get ready for an unforgettable three day weekend from the 25th to the 27th January, 2019.#BFF2019 brings you a three day festival of 20 of South Africa's greatest music acts, hosted at the Tweefontein Melkery farm, conveniently located just off the R21 between Pretoria and Kempton Park. We want you to be part of the best crowd the bands could ever hope for but we also want to ensure your comfort, hence we are only making 400 tickets available. This includes free camping for the 3 days, so bring your own tents. ***** TICKETS ***** Buy your tickets @ https://tickets.tixsa.co.za/event/boutique-farm-festival-2019 R375 per person or R555 per person including festival shirt. No under 18s. No day tickets. 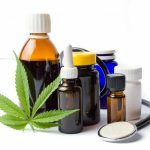 Some good news! We have decided to reserve a limited amount of walk-in . . .